I really don’t get this kind of church-sign humor, somehow. 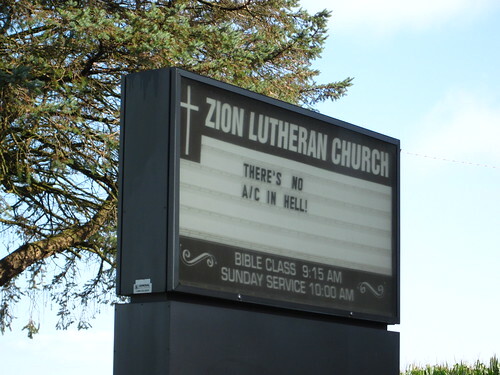 I’m pretty sure this is a Missouri Synod Lutheran church, so they have a literal understanding of hell. So how do they find this funny? “Ha ha, after you die you’ll be tortured endlessly!” That’s a real knee-slapper, all right. If I believed there was life after death, and if I believed that people who failed to abide by some set of rules would be tormented eternally in it, I’d want to warn everyone. I don’t think I’d find the prospect of their limitless suffering funny, though. You know, at least an old Puritan like Jonathan Edwards took the whole “Sinners in the Hands of an Angry God” thing seriously. Meanwhile, I rode to Brewer and back today. About 66 miles. Uneventful until I got to my driveway, which we share with the neighbors. They’d just put down some new crushed rock, and apparently a sharp bit slashed one of my brand new tires. So now I need a new tire and tube. The Pew Research Center just published this study showing the relationship between religion and agreement with the statement that torture should be used on suspected terrorists. It’s no big surprise; the people I know who would approve of torture are mostly white evangelicals. But why is this? What’s the connection between, say, a belief that God so loved the world that he gave his only begotten son so that all who believe in him might not perish, but have eternal life, and the belief that it’s okay to torture people? I’m just having trouble finding the path that connects these views. In other Pew Center news, over 10% of Americans still think Obama is a Muslim, and about 20% of white evangelicals do. Hmmm. Are evangelicals thinking that “terrorist” and “Muslim” are synonyms, and that’s why they’re ready to torture them? What proportion of church-goers are ready to torture Obama? In their defense, I should point out that the church in which I was raised, the Episcopalians, were among the least likely to approve of torture — almost as opposed to it as atheists are. Let’s see — it’s a weird and twisted journey that gets me to the point of this. I was doing my patriotic duty by watching the debate and reading Wonkette‘s liveblogging of it, and Wonkette pointed out that, in the process of pandering to the middle class, both candidates managed to say “Hey, Joe”. This led to this video clip. And then, of course, I spent way too much time looking at related clips, winding up with this one. The thing about Red House is that hearing it always makes me so sad that Hendrix died so young. Imagine the blues he’d be playing now. It’s a tragic loss to all of us. 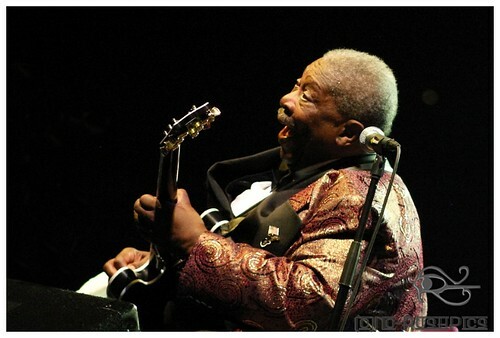 The day before his 81st birthday, playing in Rotterdam. Thank you, God, but why the hell couldn’t we have Jimi that long? I have always encouraged newcomers to the area to attend the Altenburg Fair, for a taste of real Southeast Missouri life. After this year’s fair, though, I think I’ll have to warn them that they’re likely to encounter some real Southeast Missouri intolerance as well. We constantly hear how our current decline of faith is responsible for terrorist attacks, hurricanes, AIDS, and American Idol, but can anyone imagine any candidate from either party being elected in 2008 after making such a statement? I’m too busy to really post. But I can put up links to stuff I’m wasting my time reading. I guess I go to the wrong restaurants. Popular culture is eating your brain. And it’s even ruining your appreciation of popular culture. The commotion of our human life, which lets in everything, all the light and all the music, all the mad pranks of thought and all the variations of pain, the fullness of memory and the fullness of expectation, is closed to only one thing: unity. And that, kids, is why you should be a mystic. And perhaps why a Woodstock Museum isn’t actually that bad an idea. **New York: Schocken Books, 1969 (Published originally in German, 1908). The one that got me was the 20% of non-Christians who agreed with this. What exactly do these people believe? What exactly do they mean by “non-Christian?” They believe Jesus is coming again, but they don’t care? Or they think he’s coming again, but they don’t think he’s God — just a guy with a special sort of super-power? Or they think he’s coming again, but they plan to be fighting on the side of the devil? I’m puzzled.